Aside from admitting that he's working on a new Twisted Metal game, David Jaffe has announced he wants to make a horror movie based on the series' best-known character. One has to wonder if PR reps just hold their heads in their hands every time Jaffe makes a Twitter post about projects he's possibly involved with. Every time the Twisted Metal and God of War director tweets about what he's working on, the rumors spring up across the Web and Sony seems to lock itself down and respond to all inquiries with deafening silence. The latest project Jaffe's possibly involved with? A Twisted Metal-themed horror movie. 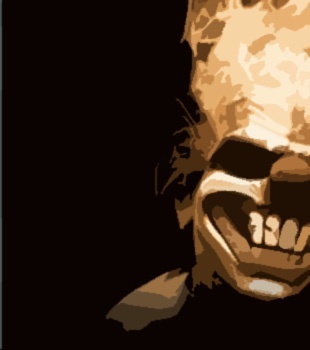 Jaffe recently expressed a desire to make a low-budget horror flick starring Sweet Tooth, the evil clown mascot of the Twisted Metal franchise. "I want us to make an honest to goodness, low-budget slasher movie and sell it on PSN exclusive. Peeps saying we are making a PSN Sweet Tooth GAME got it wrong." Jaffe later explained his thoughts a little further: "By the way, the Sweet Tooth PSN thing I want us to do is a MOVIE on PSN, like THE TESTER in terms of exclusive PSN programming...not a game." It should be noted that Jaffe appeared on the second episode of The Tester. At the moment, Jaffe has yet to confirm if this movie idea is being seriously considered by the Powers That Be over at Sony. So, for the moment, this is just a pet project that the man has expressed an interest in. Seeing as how he flat-out denied the existence of a new Twisted Metal that he was already working on, I'm taking bets that the movie will be available for download on the PSN by the end of next week.